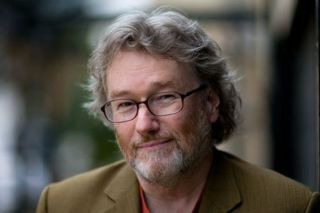 Amazon Studios will adapt "Consider Phlebas," the first book in the "Culture" series by science fiction author Iain M. Banks (pictured here), as a TV series on Amazon Prime. Science-fiction fans, rejoice! Amazon Studios is adapting "Consider Phlebas," the first novel in the epic "Culture" book series by the late sci-fi legend Iain M. Banks, for television. The famed space opera centers on an interstellar utopian society known as the "Culture," a highly advanced and progressive society that gets pulled into war by a "deeply religious, warlike race intent on dominating the entire galaxy," Amazon Studios announced Wednesday (Feb. 21). "Consider Phlebas" will be adapted by writer Dennis Kelly, who won a Tony award for the musical adaptation of "Matilda" and has penned several stage plays over the course of his career. The Estate of Iain Banks — the collective which now manages the deceased author's works — is attached to the project as executive producer, and Plan B Entertainment — the production company behind the films "Moonlight," "World War Z" and "12 Years a Slave" — is slated to produce the television series. "The story of the Culture is so rich and captivating that for years Hollywood has been trying to bring this utopian society to life on the screen," Sharon Tal Yguado, head of scripted series at Amazon Studios, said in the statement. At the center of the plot is a quest to recover an artificial intelligence known as the Culture "Mind," which is many thousands of times smarter than any human and could be used to destroy the progressive society, which Kelly called "a society truly worth fighting for" in the statement from Amazon Studios. "We are so honored that we have been chosen to make 'Consider Phlebas' into a television series we think will be loved by fans for years to come," Yguado added. Banks' writing has also been honored in another way: The private spaceflight company SpaceX has named its drone-ship platforms used to land Falcon rocket boosters at sea after ships from Banks' "Culture" series. Banks died of cancer in 2013. SpaceX's first two drone ships are named "Of Course I Still Love You" and "Just Read the Instructions." "Just Read the Instructions" is used for booster landings after Falcon 9 launches from California's Vandenberg Air Force Base. "Of Course I Still Love You" is based in Cape Canaveral, Florida, and is used for launches from SpaceX pads at Cape Canaveral Air Force Station and NASA's Kennedy Space Center. Earlier this month, SpaceX CEO Elon Musk said a third drone ship is under construction to support launches of the company's new heavy-lift Falcon Heavy rocket (which features a three-booster first stage). Musk announced on Twitter that the third drone ship will be called "A Shortfall of Gravitas." The name is inspired by the fictional spaceship "Experiencing a Significant Gravitas Shortfall" from Banks' novels "Look to Windward" and "Matter."